"Top o’ the morning to you and yours!" On this St. Patio’s Day installment of Mirtha Stuwort we will learn how to entertain the Emerald Isle way. Get ready to dream green! Get your able assistants to get out all your leftover cans of paint. Take all the pictures off one of your walls (preferably the living room). Use a roller or brush and paint yourself a rainbow on your wall. But you aren’t done yet! Go to a costume rental place and rent a leprechaun costume. Pay one of your neighborhood kids to sit at one end of the rainbow dressed up like a leprechaun. Oh I almost forgot! Paint one your large kitchen pots black. Empty out your potato bin and spray paint them taters a lovely shade of gold. Now you have your pot-of-gold at the end of the rainbow (touch the rainbow above to see)! Make up some lime Jell-O in a shallow pan. Try to get the Jell-O to a depth of approximately ½". In another container smooth a layer of whipped topping in an even layer in bottom of dish. Cut out shamrock shapes with a cookie cutter. Lay them gently on the bed of whipped topping. Voila! "Shamrock Clouds!" Faith and Begorra! (Whatever that means!) 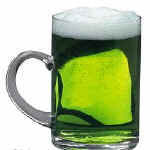 We can’t forget about the green beer! And Mirtha does like to tip her hand now and then. (Burp!) Just add some green food coloring to your favorite brew. Since St. Patrick’s Day is supposed to celebrate St. Patrick driving the snakes out of Ireland, lets do something to commemorate that shall we? Get some small snakes from somewhere on your property - you can have one of your assistants do it for you. And believe me, they are out there! If that is too much for the squeamish at heart, go to a confectionery store and buy out their supply of gummi worms. You can pass them off as snakes in a pinch and eat them afterward. Use the real ones for a centerpiece on your table (in a terrarium of course). The gummi worms can be served in one of your crystal bowls as part of dessert. But don’t drink too much green beer and try to eat the real ones!!! Cut open several larger green trash bags and layer them on your table as a festive tablecloth. After your meal – it’s easy to clean up! It was at one time called the "Seamroy". It is thought to symbolize the cross and the blessed trinity. The Druids revered it as a sacred plant because it’s leaves formed a triad. St. Patrick is thought to use the Shamrock in his teachings. He bent down and picked a shamrock and compared the three leaves to the Trinity. Also legend has it that since snakes are never seen in Ireland, due to the supposed banishment of them by St. Patrick himself, It must be due to the proliferation of the shamrock or trefoil. 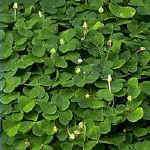 Plant Info: "Irish Shamrock" or more commonly known as the "European Wood Sorrel" is a creeping perennial with heart shaped leaflets in threes. It can grow to a height of 3 to 5 inches and a width of 12 to 18 inches. It grows in zones 3 to 8 and starts blooming in mid-spring. I t prefers partial sun and produces usually white flowers. Some varieties can produce pink, yellow or rose blooms. Usually used as a border plant. I hope you're inspired to do some entertaining this St. Patrick’s Day. Follow these tips, and your friends will be green with envy!